The halo of the Milky Way has many different components, among them the dark matter halo, the gaseous halo and more compact objects like satellite galaxies, globular clusters and stellar tidal streams. With this chart here I have tried to depict the compact kind of objects as seen from Earth, with known (or at least suspected) populations and relations between the objects color-coded (see below). The biggest problem was the concentration of globular clusters towards the galactic center, resulting from the fact that many of these orbit close to the galactic bulge. To avoid completely unreadable clutter there the names of objects close to the galactic center only appear at higher zoom levels. In the last decades many discoveries have improved our picture of the Milky Way halo. In particular the Sloan Digital Sky survey (SDSS) and several infrared surveys of the galactic plane have netted plenty of globular clusters (GCs), dwarf spheroidal galaxies (dSphs), very faint dwarf galaxies (UFDs), intermediates that may be one or the other (GC/UFD), and stellar tidal streams or 'overdensities' in our close galactic neighborhood. With the SDSS extending into the southern hemisphere, and the results of the Gaia mission, many more discoveries are to be expected. As it is, the count now stands at 247 companions, 185 GCs, 47 satellite galaxies and 15 intermediates with ambiguous properties. The lines in the map are the major identified tidal streams or great circles of alignment (see below). Switch the different components of the galactiic halo on and off with the checkboxes below the map. Zoom and pan with mouse wheel/pinch and dragging. The source for the underlying map can be found at my Github repository. The main difference between GCs and dwarf galaxies is that GCs only had a single burst of star formation and therefore a uniform stellar population. This makes it possible to determine their relative ages from the distribution of stars in color-magnitude diagrams (see next paragraph). Dwarf galaxies, on the other hand, are more diverse, many still have ongoing star formation, and likely a central black hole. Several GCs (omega Cen) have also been found to contain a central black hole and diverse populations; because of this they may be the remnant nuclei (N) of former galaxies. These include M 54, likely the core of the Sagittarius dwarf, NGC 2808, possibly the remnant core of the CMa dwarf or the newly found Gaia-Enceladus galaxy that collided with the Milky Way, NGC 2419 and Omega Centauri with no known associations at this point. (Mackey, van den Bergh 2005). Based on their characteristics, the globular clusters (GCs) of the Milky Way fall into different populations. The main distinguishing features are orbital motion and position, age estimated from the horizontal branch morphology and metallicity. The diagram on the right shows the relation of the latter two parameters for GCs of the Milky Way and some of its satellites. The curved lines are thought to be isochrones, i.e., they denote constant age along their path. The horizontal branch morphology refers to the distribution of stars that have left the main sequence and appear distributed horizontally on the Hertzsprung-Russell diagram, including RR Lyrae variable stars, the small cousins of Cepheids. The horizontal branch ratio is the ratio between stars to the right (red) side and on the left (blue) side of the RR Lyrae region of the distribution. A good overview of HB stars can be found in Catelan 2009. Three distinct populations can be identified: Old metal-rich GCs in the galactic bulge and disk (BD), old metal-poor GCs of the old halo (OH) and younger metal-poor GCs of the young halo (YH), which are also mostly further away from the galactic center than the old halo members (Zinn 1993). It is thought that the bulge/disk and old halo formed mostly along with the Milky Way proper, while the young halo contains GCs caught from accreted dwarf galaxies at a later time. It should be noted that 'young' and 'old' here are not absolute categories, but merely relative indicators of age, so that a 'young halo' cluster may still be 10 billion years old, which is still younger then the Milky Way proper. Several dwarfs and GCs lie along a great circle around the galactic center, called the Fornax-Leo-Scuptor (FLS) great circle after its main members, shown as the pink line in the chart. It is not quite clear yet if these are related remnants of a broken-up galaxy or represent a chance alignment, but there is mounting evidence that at least some of the members are indeed related. Other research sees all of the Milky Way's dwarf companions aligned in a "disk of galaxies" (Kroupa et al. 2004). Another indicator of possible extragalactic origin is a retrograde motion (R), at this point there is no alignment or association known, so it is included as just an indicator. Not shown: Gaseous and stellar clouds, open clusters in the Milky Way halo, Globular Clusters of (undisrupted) satellite galaxies. The four largest of which - the Magellanic Clouds, the Fornax and the Sagittarius dwarf - are known to contain their own globular cluster systems. Intriguingly, all of these are also associated with tidal features, as shown above. The Virgo stream or Virgo stellar over-density is a very faint and very disrupted remnant that has been found in SDSS data. Recent analysis (Martinez 2006) has shown that it most likely represents the remains of an older loop of the Sagittarius dwarf around the Milky Way. Another tidal feature, the Monoceros stream or Anti-center stream, also found in SDSS data, probably is a part of the CMa dwarf's tidal stream that wraps several times around the Milky Way. Yet more debris streams have been reported in Grillmair 2006, one of which may be related to the Boötes III dSph. 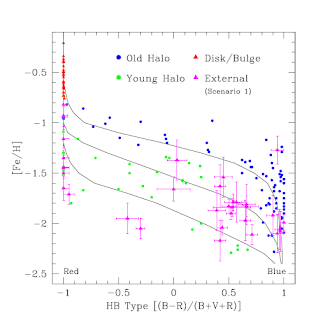 And more discoveries of Halo features are sure to come with further SDSS and other studies. The list shows the members of the different halo components ordered by galactic longitude. The values are: Name(s) of the object, galactic longitude and latitude in degrees, absolute visual magnitude, half light radius in parsec, distance from the Milky Way center in kiloparsec, morphological type, population and stream membership (see below). Sgr II       Laevens 5  18.9  -22.9   -5.2    32     60     -2.2    UFD           Sgr? Palomar 1              130.07  19.03  -2.5     2.2   17.0   -0.70   GC        BD  CMa? Tri II       Laevens 2 141.4  -23.4   -1.8    34     36     -2.2    GC/UFD        TriAnd? Segue II               149.4  -38.1   -2.5    34     38.0   -2.0    GC/UFD        Sgr? TriAnd? Palomar 2              170.53  -9.07  -8.0     5.4   35.4   -1.30   GC        YH  Sgr? Koposov 2              195.11  25.55  -0.4     1.8   26.3   -0.6    GC        YH  Sgr? Segue I                220.5   50.4   -1.5    29     25             GC/UFD        FLS? Sgr? Hya I                  224.7   29.1   -2.5                  -0.91   GC/UFD        CMa? M79          NGC 1904  227.23 -29.35  -7.9     3.0   18.8   -1.37   GC        OH  G-E? CMa? For I        ESO 356-4 237.10 -65.65 -13.4   668    140     -0.99   dSph          FLS Mag? Com I                  241.9   83.6   -4.1    77     45.2   -2.6    UFD           FLS Sgr? NGC 1851               244.51 -35.04  -8.3     1.8   16.7   -1.03   GC        OH  G-E? CMa? NGC 2298               245.63 -16.01  -6.3     2.4   15.7   -1.71   GC        OH  G-E? CMa? Eri II                 249.78 -51.65  -7.1   172            -1.5    UFD           Mag? NGC 4147               252.85  77.19  -6.2     2.4   21.3   -1.5    GC        YH  Sgr? Pic I                  257.30 -40.65  -3.7    31            -1.7    GC/UFD        Mag?? Koposov 1              260.98  70.76  -4.3     3.0   36.3   -0.6    GC        YH  Sgr? Leo V                  261.86  58.54  -5.2    42    180.8           UFD           FLS? Hor II                 262.47 -54.14  -2.6    47            -2.1    UFD           Mag? Ret II                 266.30 -49.74  -3.6    32            -1.8    GC/UFD        Mag? Pic II                 269.63 -24.05  -3.2    46            -1.8    UFD           Mag? Ret III                273.88 -45.65  -3.3    64                    UFD           Mag?? Eri III                274.96 -59.60  -2.4    18                    GC/UFD        Mag? Hya II                 295.61  30.46  -4.8    68    128     -2.2    UFD           Mag? M68          NGC 4590  299.63  36.05  -7.3     4.6   10.1   -2.06   GC        YH  CMa? Rup 106                300.89  11.67  -6.3     6.8   18.5   -1.49   GC        YH  CMa? Tuc IV                 313.29 -55.29  -3.5   127            -2.3    UFD           Mag? Tuc III                315.15 -56.19  -2.4    44            -2.3    UFD           Mag?? Tuc V                  316.31 -51.89  -1.6    17            -1.8    GC/UFD        Mag? AM 4                   320.15  33.54  -1.6     3.7   25.5   -0.97   GC            Sgr? Phe II                 323.69 -59.75  -3.7    27                    GC/UFD        Mag? Tuc II                 328.08 -52.33  -3.9   199                    UFD           Mag? NGC 5053               335.69  78.94  -6.7    16.7   16.9   -1.98   GC        YH  FLS Sgr? Gru I                  338.68 -58.24  -3.4    70                    UFD           Mag?? FSR 1758               349.22  -3.29  -8.6    10.0    3.7   -1.5    GC/UFD    BD  (N)? Gru II                 351.15 -51.94  -3.9    93            -2.0    UFD           Mag?? Boö II                 353.7   68.9   -2.7    51     47.6   -2.0    UFD           Sgr?